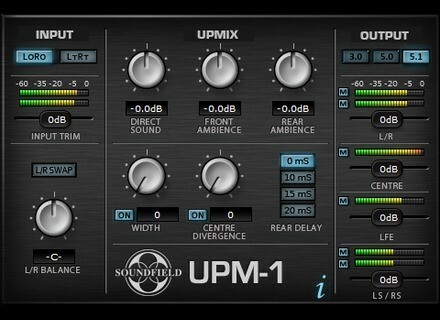 UPM-1 Plug-in, Audio/MIDI Converter Software from Soundfield. UK microphone manufacturer SoundField launched a software version of their UPM-1 stereo-to-5.1 upmix processor at this year's IBC. Whilst the hardware UPM-1 is suited to live broadcast applications, the new plug-in version is designed for post-production workflows. It is available in VST (PC and Mac), RTAS (PC and Mac) and Mac-only AU formats and is aimed, like the hardware original, at broadcasters who need to ensure that all of their material is transmitted in fold-down-compatible 5.1 surround, including archive stereo material, effects and jingles. 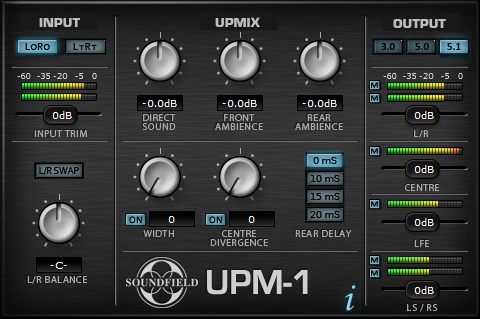 The UPM-1 plug-in is designed to create a more natural-sounding 5.1 mix than many existing stereo-to-5.1 upmix devices that rely on reverb and phase manipulation. Instead, it uses an algorithm which analyses the stereo input material and separates ambient sounds from the direct sounds — or what might broadly be referred to as the ‘distant’ and ‘close-miked’ sounds. As with the original hardware unit, the plug-in is designed to allow detailed adjustment of the relative levels of direct sound and front and rear ambient sound in the final 5.1 mix, with continuous software rotary controls for Width and Centre channel Divergence. Level, Mute and Solo controls are also provided for each channel. The UPM-1 plug-in is currently scheduled to ship in October 2010. Subatomic Labs Mantis307 v1.9 Subatomic Labs has updated Mantis307 to version 1.9.